Having an active blog is one of the most important aspects of your consulting website. An active blog with quality, original, contrarian content is essential for generating leads through your website. Posting your insights to your blog will put you ahead of 80% of your competition. But how do you position yourself in front of all your competition? Could you provide your prospects with a better experience for reading your articles? Don’t send your prospects to a page full of dozens of articles. Instead, organize your content around a central theme. Guide them through what to read in a specific order. When you organize this and put it on your website, it’s called your “Resources” page. 1. It’s more user-friendly. Put yourself in the shoes of your prospect. If one comes to your “Blog” page, if they are interested in reading your material, they don’t know where to start. Your resources page shows them where to start, and tells them why they should start there. 2. It’s more SEO friendly. Most blog pages simply list your posts as you publish them. On your resources page, you control the headlines, sub-headers, and all the text. By curating your articles and organizing them, you will have far more control over how it ranks in the search engines. 3. It gives you the perfect platform for building strategic alliances. Using your resources page, you can reach out to peers in your industry and offer them a link to your services page. Your goal is to use this page to position yourself as a leader in your industry. So use it to combine the expertise of both you and your peers who help your target audience in different ways. 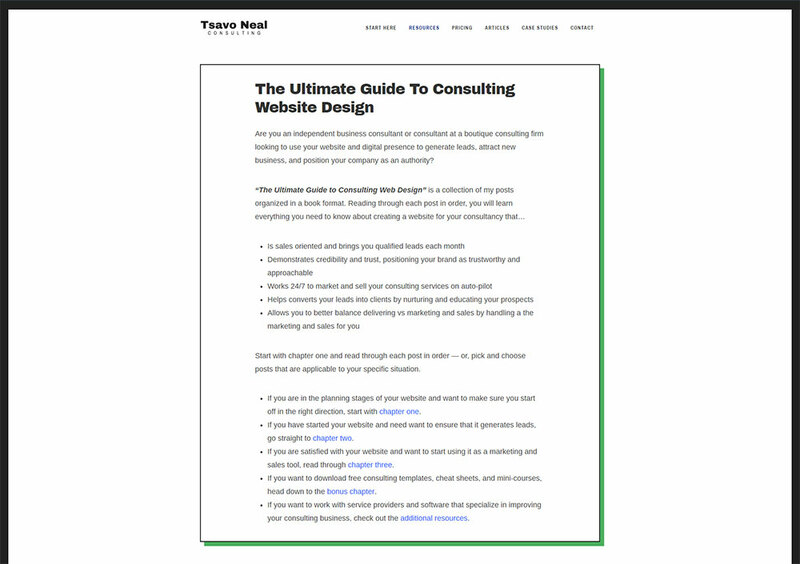 Here’s how you can come up with an effective resources page for your consulting website. You’ll start by brainstorming some ideas for your central theme. Your central theme should revolve around the 1 or 2 main problems your prospects face in their business — and where they want to be. What is the main problem your prospects face that you solve? What is the most compelling business outcome they will achieve as a result of working with you? Take a look at some of your previous clients. What did you help them with? Ask them which themes were critical for them to learn about before hiring you. Use the answers to those questions to organize your resources page. And with that page, your content should help them reach an understanding of how to solve this problem. 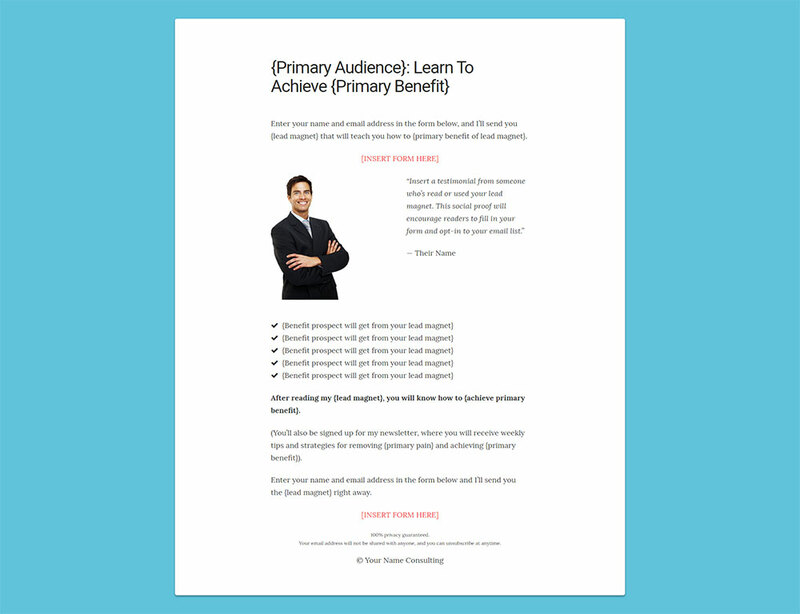 If you have at least 6-8 articles, you have enough to create your resources page. Find 2-3 other articles or resources from your peers to include as well. Create an outline of your resources page using my example, or the examples below. As you produce new content, insert it into your resources page. Your resources page will give you a “big-picture” of what you’re trying to achieve with your thought-leadership. As you add to it, you’ll figure out what pieces are missing. Always ask both your prospects and your current clients what is missing from this page. Their answers will give you all of the content ideas that you’ll ever need. Your resources page also makes a great segway to introducing prospects to your newsletter. I recommend creating a dedicated landing page for your newsletter to increase your opt-in conversion rate. 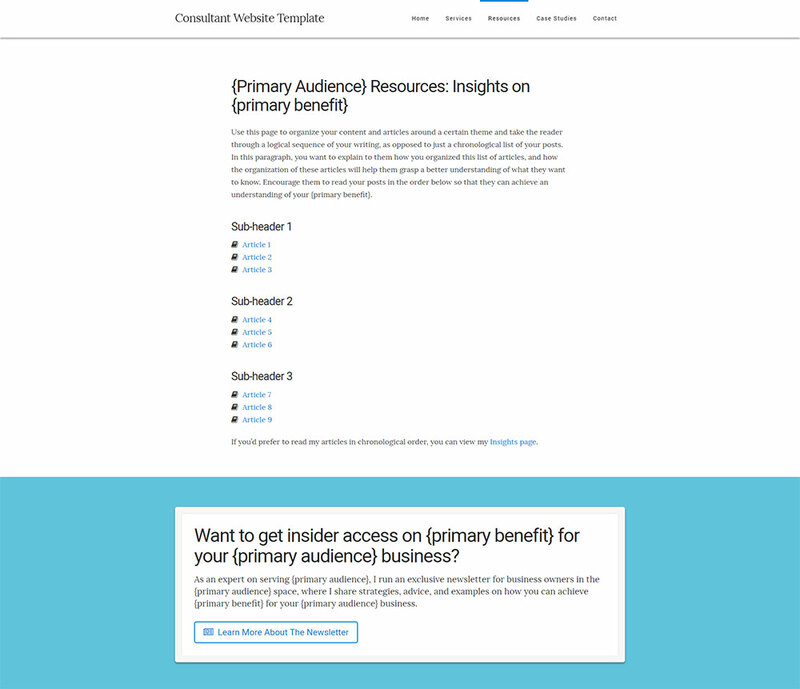 You can see my example here: Consultant Newsletter Landing Page. They are coming to this page to learn about your expert insights in their industry. Your newsletter should provide them with similar content — but instead, it’s more personalized and fosters more direct interaction. The advantages of having your own email list are plenty: you can educate and nurture your leads at scale, and tell them when you are taking on new projects. This is a list of your qualified leads. You don’t need quantity, focus on quality. NOTE: These were hard to find — even many of the best consultant websites don’t have a resources page. There’s no coincidence that the consultants who do have a resources page are at the top of their craft. Philip’s resources page has everything a good resources page should have — his best content, articles, and an opt-in for his list. As mentioned in this article, your resources page is the most natural way to lead your prospects to your newsletter. Philip’s resources page leads with an opt-in form. The bulk of his resources page consists of his most valuable pieces of one-off content. Some of these are free, and some of them aren’t. Either way, he’s providing a list of his most valuable content to his new prospects. The last section of his resources consists of his articles. Prospects who aren’t yet ready to check out his one-off content can check out his periodic content. The page ends with more about Philip and some social proof. Philip’s Resources page is designed perfectly for positioning him as a thought-leader for positioning strategy. 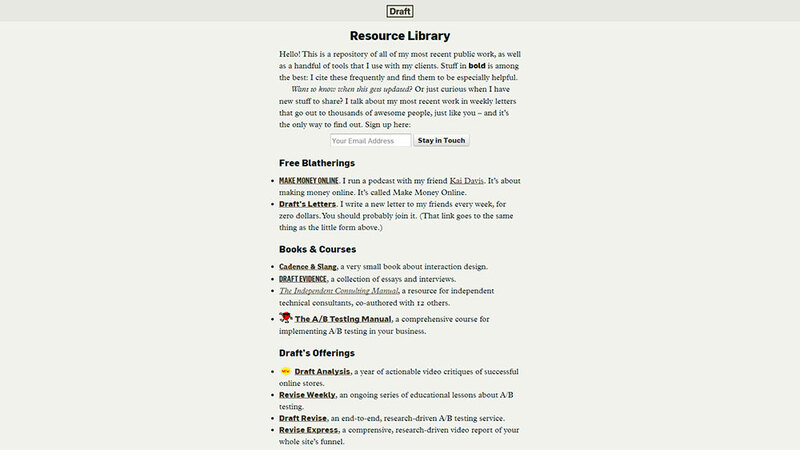 Simple but effective, Nick offers a ton of valuable content on his resources library page. To make it easier for his prospects to choose what to read or listen to, he bolds his most important content. He posts his podcast appearances, guest blog posts, and conference talks. This makes for great social proof for his business. He offers two opt-in forms on this page to help turn some of his interested prospects into qualified leads. ActionPlan Marketing’s “Free Stuff” page is a great way to get their prospects through the door with their lowest barrier to entry products. 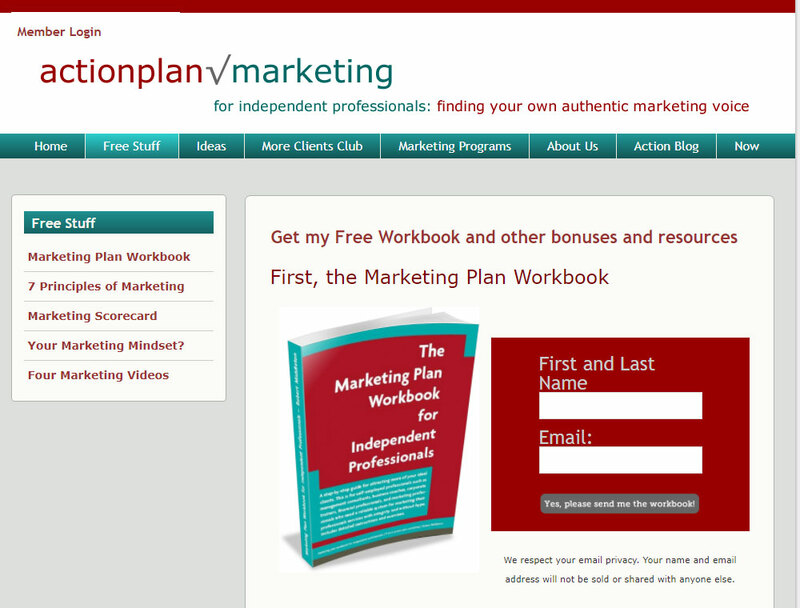 Robert offers 5 different pieces of content, ranging from workbooks to video series. All these help position him as an expert and generate leads. All the content he offers on this page helps his prospects learn more about their marketing. It also brings awareness to the problems they face in their business. His resources make his content more relevant, bringing his prospects further into his sales pipeline. 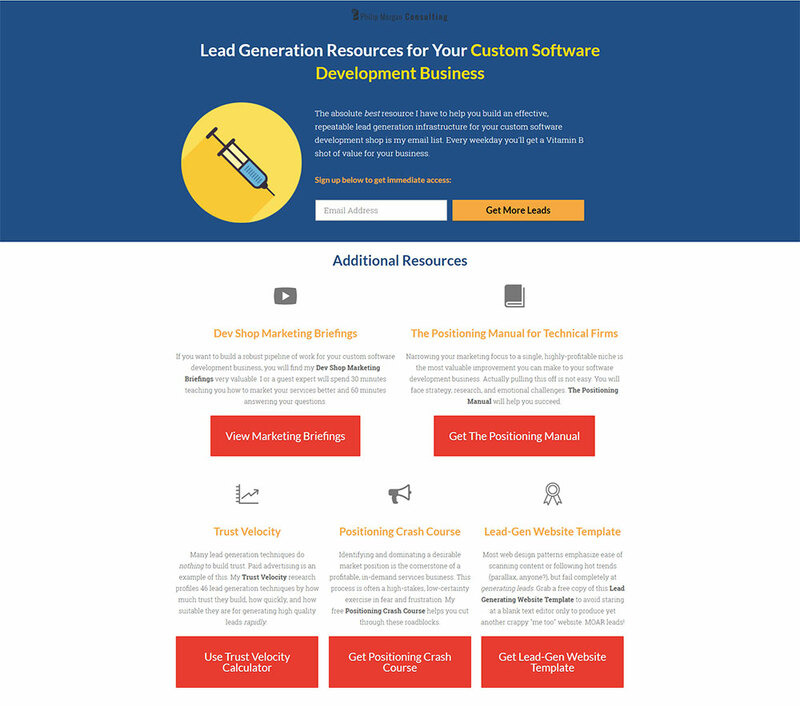 By creating this helpful, free content, and creating a resources page to host it, you can rapidly increase the leads you get through your website and the rate at which you become a thought-leader in your industry. DO: Link to resources and providers other than yourself on this page. With your resources page, you’re crafting and curating different pieces of the puzzle that tell your whole story. Chances are, you don’t have all the answers, and peers in your industry can help fill those gaps where you don’t have that same expertise. B) Build relationships with the people your peers, helping you network with other experts who offer different services to the same industry. DO: Put a link to your blog on this page. Although most prospects will appreciate you organizing your content and your help in choosing them what to read, some potential clients want to see what you’ve written lately. Make sure you include a link to your blog on your resources page. If you publish content once every two weeks or more, include both in your top level menu. DON’T: Use this page to consulting services. This page is for information, not services. That said, you can and should put products on the first rung of your “product ladder” — books, courses, etc. With your resources page, you want to get your prospects on your email list by showing them that your expertise is relevant and valuable to them. It will be one of the highest converting pages for your email list, along with your blog posts with content upgrades. 1. Pick a central theme that is important to all of your prospects. 2. Organize all your content in order that helps educate them on this theme. Create subheadings or chapters to make it easy to find what’s relevant for them. 3. Build your resources page using the above examples as inspiration, or my Consultant Website Template Resources Page. By creating a resources page you’ll provide more value for your prospects and form more strategic alliances. It will become one of you and your prospects favorite pages on your website. When you do this right, you’ll have your potential clients saying to you how helpful they’ve found the order in which you’ve put your content.